My journey began seventy years ago in Berlin, Germany. I entered the United States as a motion picture editor in 1964. After forty-three years in film, and a life with a menagerie that included twelve cats, five dogs, nine geese, several chickens and Jimmy the Rooster, I met Honeycomb the Alpaca. Then the past became prologue. Her fabulous eyes, gentle nature, incredibly soft fleece, and humming sounds introduced a new phase in my life. 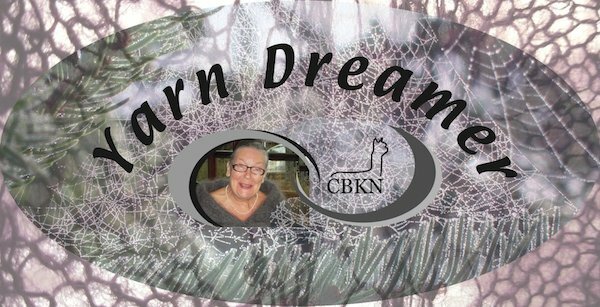 I fell in love with this gift from the Andes providing fleece to create one of a kind hand-spun yarns and garments for you to treasure and enjoy!!! Knit in Paradise (or not far from it!) at Insel Haus B&B on Bois Blanc Island, Michigan. Starting at just $320 per person for lodging, meals and knitting instruction during a three night stay at Insel Haus B&B. Add $50 per night for a private room. Additional nights, $50 per night. See our Yarn Dreamer website for more details.